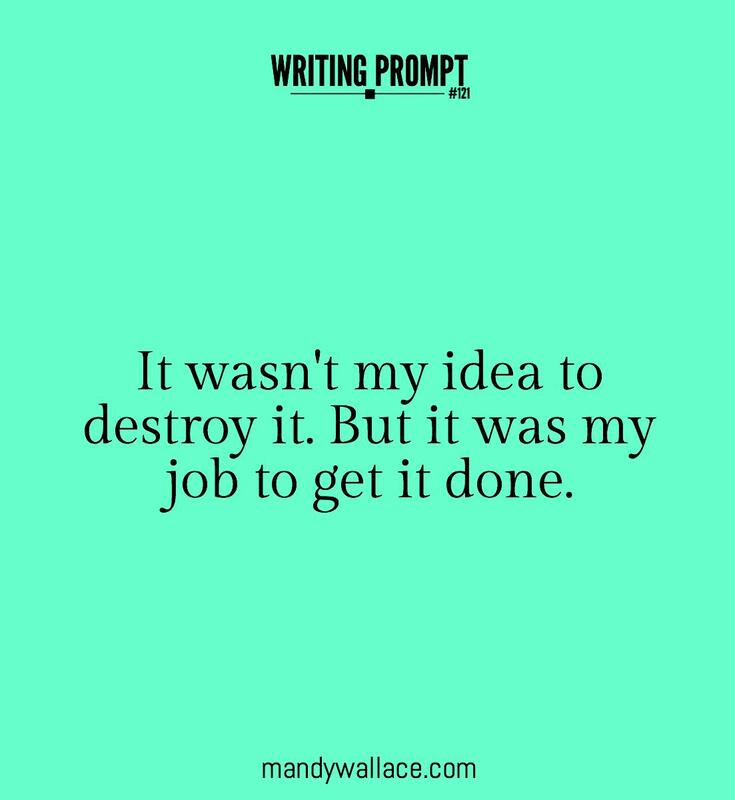 It wasn’t my idea to destroy it. But it was my job to get it done. Take 5 minutes to think about the prompt. Who is speaking? What’s the job? Why is it this character’s job and why does s/he feel obligated to do it? Write for 15 minutes. Go wherever the story takes you without question. Share your story snippet in the comments to inspire and encourage your fellow writers (if you feel like it). This is scary. First ever public post of something that I’ve written and I don’t really know how well this turned out. I’d appreciate some criticism, please! Pebbles and twigs poked into my belly as I slowly crawled along the ground, my forearms propelling me forward as I silently slithered closer, closer. I could almost feel the darkness envelope me at this point as I stifled a scream because of my overactive imagination. It turned out to be only a frog, but it was clammy and wet enough for me to not be able to suppress a shudder. Only the new moon gave me light to maneuver my way towards my goal. It was hardly enough to see obstructions in the shallow trench that was my path and more than once I swallowed an “oomph!” when my elbow hit a hard rock. But the dark was my friend, shielding me from the barriers I had yet to overcome, the enemy that was still ahead. Soft, murmuring voices could be heard, alerting me to the people who could keep me from my goal. I pegged the three to my right and, counting off, knew that only two waited within. Easy enough. A rock thrown in the bushes far off at the right got their attention and the two guards within took off to supplement the three outside sentries. It was a small window of time but I could just make it if I was fast and stealthy enough. I quickly took off at a low run, keeping my weight to the outsides of my soles as I read Native Americans did to minimize the noise. What do you know, it works! Keeping to the shadows, I sped silently past my target and doubled back, entering through the vulnerable, unguarded rear opening. I was in. A loud war whoop bust from my throat as I toppled over the wooden chairs and benches that were the makeshift walls of my brother’s fort. The girls’ team won the war games that night! Nice work putting yourself out there, Ramona. Thank you for sharing your work. I like the sensory information you included. And the fun surprise at the end that it was just a game.